As we wander through the streets leading from the Zocolo, two buildings attract our attention. The first is known as the Blue Tile House. It was built in the 16th century and is covered, not surprisingly, in hand made blue tiles from that period. 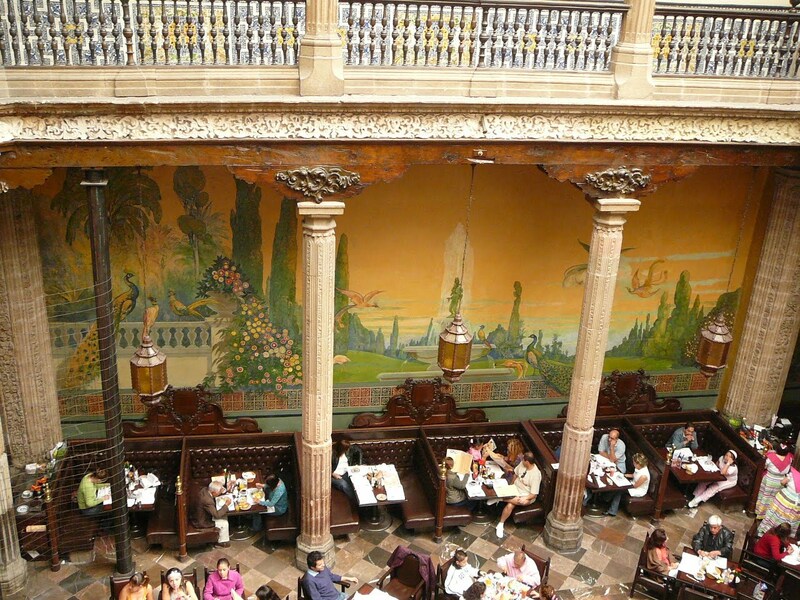 Inside, is a Sanborns department store with a wonderful restaurant with walls covered in murals from the 1930’s. The second building is the Palace of Fine Arts, which is an absolutely fabulous building from the Art Deco/Beaux Arts period. 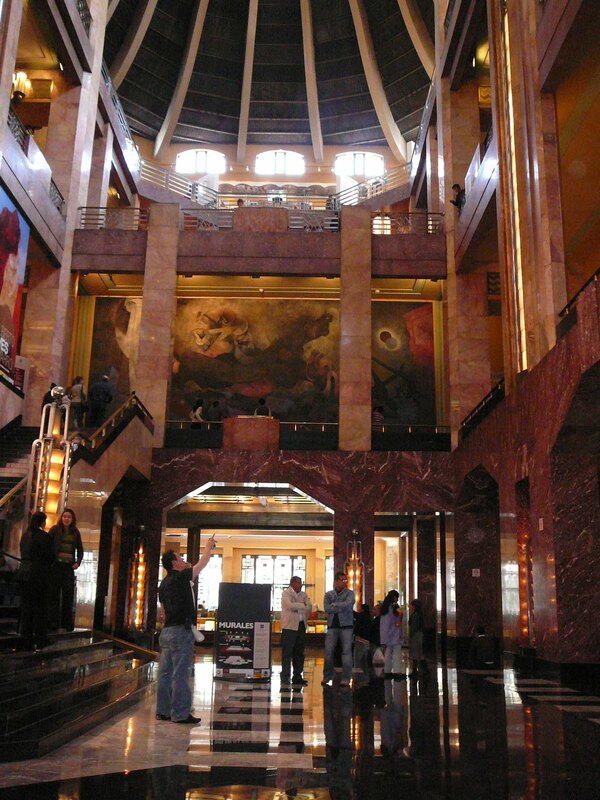 Inside there are three levels all covered in Murals by famous artists of the period including Diego Rivera. Any wall that hasn’t got a mural is clad in wonderful pink marble and edged in black. 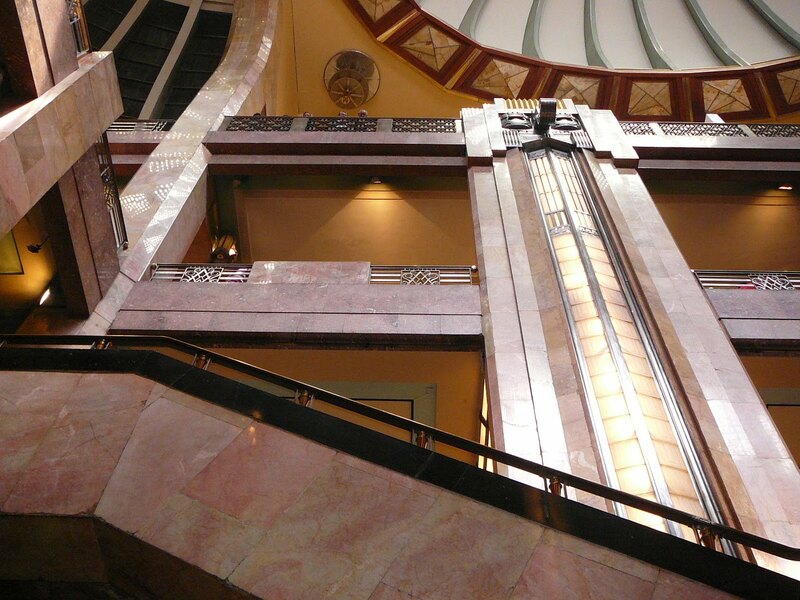 Staircases are either in black or white marble. 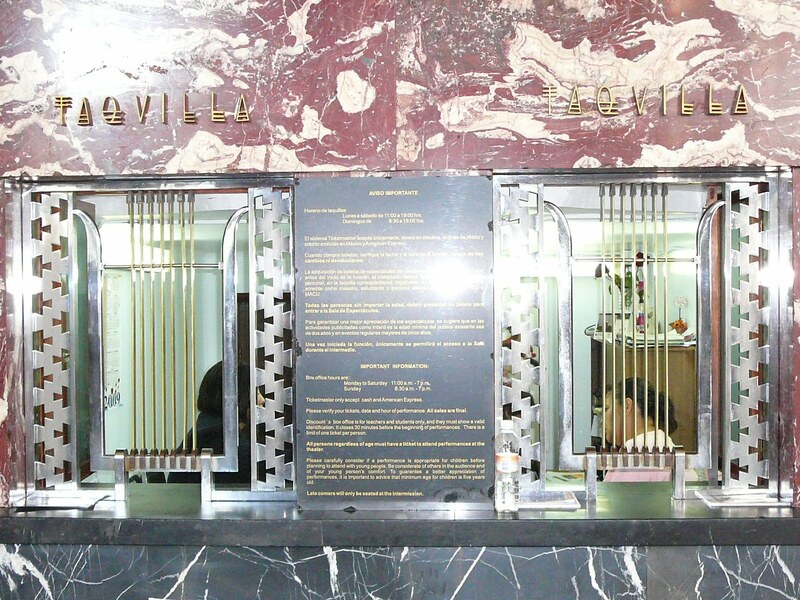 Every detail is striking in its art deco design, even down to the small ticket office windows. 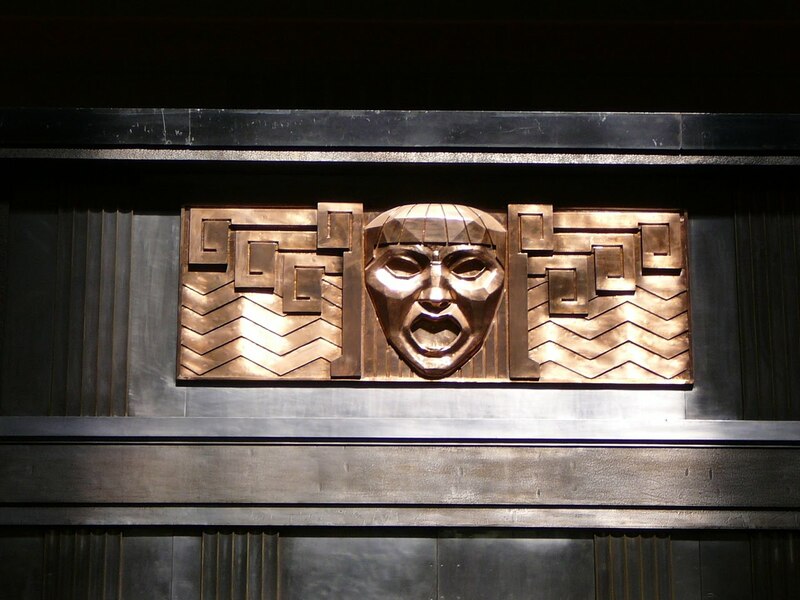 As we both collect Art Deco we are in heaven and spend two hours wandering around the building examining every amazing detail. The building houses a theatre with a famous Tiffany Curtain which we long to see, but sadly the theatre is closed for the weekend. After lunch, we get back on the Turibus and continue round the City. We are impressed with the number and size of the parks and green areas. Many of the main streets are huge boulevards, split by a park like divide full of trees and benches. There is art everywhere: posters of famous artworks line one street, photographs of famous building line another and everywhere there are seats and benches often designed by famous artists in modern designs. If all this street art appeared in any European or North American city, it would be vandalized and covered in graffiti, but here everything is left untouched. The city is full of statues . We spend most of the day listening on our headphones to endless descriptions of this statue of a famous Mexican President and that Statue of a famous revolutionary. But the only time we get excited is when we drive past a statue of Delores Del Rio , but no mention is made of it through our headphones. In the evening we dine in an Argentinean restaurant – the city is full of them. Sadly it has a large screen TV inside, tuned to the Superbowl which is being played today. The restaurant is full of Mexicans all yelling and screaming for their favorite team. 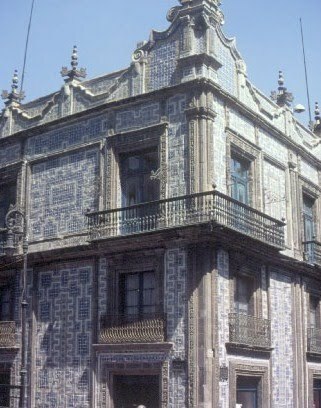 This entry was posted in local architecture, local transportation, Mexico City, The Blue Tile House, The Palace of Fine Arts, travel, travel review, travelogue, Turibus. Bookmark the permalink.